If you can walk to your local letter box and back fairly briskly then you can probably do this! * You don't need to bring a partner. * People with two left feet welcome. * Come on your own or bring friends. * Make new friends and have great fun. * It's more fun that the gym. * It's great gentle exercise. * Show off what you learn to friends. * Get taught by a qualified teacher. * A beautiful dance floor. * Audition on Strictly Come Dancing. * Adults and older teenagers accompanied by an adult are welcome. If you are in any doubt about your health, please seek qualified medical advice. 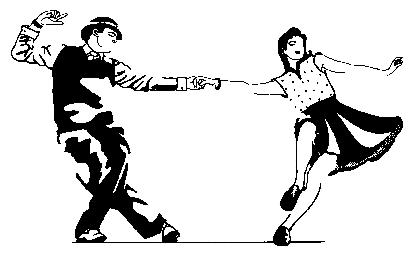 We play steady melodic, hit tunes from the 50s right up to the present day that are pleasant to listen to and to dance to. No heavy metal or head banging stuff. Examples of our recent play list will be posted below shortly. You must be an adult unless accompanied by an adult. minimum age is circa 15.
check out our website www.jivedanceparty.com for venue info. while we would like it to be ok, the answer is not really, i.e.no. it's better if the ticket does match the attendee as it may cause confusion otherwise or slow your admission. we dont really have the manpower to handle changes but may do so at our discretion where we can. Come to the class, bring a friend, dress well, use a good deodorant and cologne if possible as it is a form of sociable exercise.